Through the principles OF God's Word. Shining our light in the community. TEACHING & PREACHING THROUGH THE COMMUNITY. Shining our light through performing arts. TEACHING & PREACHING THROUGH PERFORMING ARTS. 17 No weapon that is formed against thee shall prosper; and every tongue that shall rise against thee in judgment thou shalt condemn. Shining our light through deliverance. TEACHING & PREACHING THROUGH DELIVERANCE. The Thief Cometh For To Steal, Kill & Destroy, But I Came That You Would Have Life More Abundantly. Enjoying A Resurrection Drama Play For God's Kingdom. Bishop Willie C. Butts is the senior pastor of Faith and Power Church (FPC), located in Deerfield Beach, Florida, which serves numerous families across South Florida and the British West Indies. Faith and Power Church was birthed out of the Revival Faith Center Ministries International under the leadership of Apostle Janice L. Dillard. Bishop Willie C. Butts is also the founder of Willie C. Butts Ministries established on July 1, 2002. Bishop Willie Butts is an esteemed teacher of the word, conference speaker, family adviser, and business consultant. He has an extraordinary love for God and God's people. Bishop Willie Butts is committed to teaching practical Kingdom principles, using "out-of-the-box" techniques such as visual arts, performing arts and street ministry to revolutionize lives - one person at a time. A native of Deerfield Beach, Florida, Bishop Butts and his wife, Prophetess Wilma Butts, received the vision for Revival Faith Center Ministries #3 in 1991. Bishop Butts held the church's first bible study class in his home living room. In a matter of weeks, Bishop Butts needed additional space and moved the service to a family daycare facility. Over the years, the ministry grew rapidly, and was renamed "Faith and Power Christian Center", then later became "Faith and Power Church". FPC has become a trademark throughout the community and serves as a lifeline for families in need. 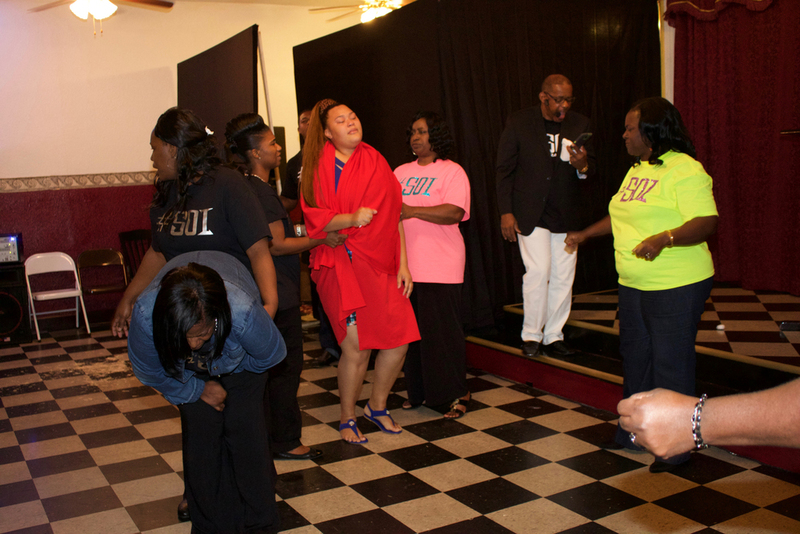 Under the direction of Bishop Butts, FPC has hosted over 7 gospel plays with over 500 audience members in attendance, held hundreds of community outreach events and fed thousands of hungry families. Bishop Willie Butts continues to develop radical methods to deliver God's word to people around the world. As a former Sergeant in the United States Armed Forces, Bishop Willie Butts served the people of America with great pride. After his completion and honorable discharge, Bishop Willie C. Butts graduated from the Art Institute of Fort Lauderdale, Florida, in Graphic Design. In addition to pastoring, Bishop Willie C. Butts is the President and CEO of Excellent Graphics, which services clients across the country. During his service in the Armed Forces, he acquired a passion for leadership and discipline. Bishop Willie C. Butts teaches young boys and adult males how to become powerful men of faith, and effective leaders within their families and communities. His mentorship programs "Man-Talk" and "Boys 2 Men" are acclaimed by men as "life-changing." His Leadership Empowerment Training classes continue to be much sought-after by pastors and business professionals throughout South Florida. Renowned conference speaker, leader and spiritual father, Bishop Willie C. Butts is known for his "no nonsense" teaching, and visual approach to the bible. He has encouraged thousands to develop a deeper relationship with God. Bishop Willie C. Butts and his wife Prophetess Wilma Butts live in South Florida. This dynamic duo have three daughters who also play a pivotal role in ministry. Bishop Butts is a great man of Faith which has allowed him to serve in ministry for over 20 years. Prophetess Wilma J. Butts, a native of Deerfield Beach, Florida, is a renowned teacher, life coach and conference speaker who demonstrates the power of God to others. As the wife of Bishop Willie C. Butts, she co-pastors Faith and Power Church (FPC), and serves as the Regional Prophetess in the U.S. and British West Indies under the Revival Faith Center Ministries covering. As a mighty vessel of God, Prophetess ministers the word of God with power and conviction. As a leader of the gospel, Prophetess Butts has a unique influence in both ministry and prayer outreach. Prophetess shares her passion and keen revelation of prayer with hundreds of men and women as far as the Turks and Caicos Islands. She hosts over 40 prayer outreach meetings a year, teaching and expounding on the power of effective prayer and declaration. Her "tell it like it is" approach, combined with compassion and love, resonates with the hearts of young and old. With a Bachelor's degree in social work and a history of working with emotionally disabled adults, Alzheimer's patients and sexually abused teenagers, Prophetess has a heart for restoring women and family relationships. She is the founder and overseer of the Women's Ministry at Faith and Power Church. She frequently hosts Sunday morning service, Bible study, fellowship meetings and women conferences. She serves as the founder of Girls 2 Women, an innovative Mentor-ship Program designed to teach women how to operate Kingdom Principles and becoming effective leaders in their communities. During the program, women give themselves a "new" name symbolic of their journey to, greater faith, self-worth and complete transformation. Women around the country acclaim these Mentor-ship programs to be life-changing and innovative. Committed to mending broken families, she works alongside Bishop Willie C. Butts providing counseling, assistance and necessary resources to families in need. Her goal is to make a lasting impression in the lives of people by sharing the love of God. Above all her accomplishments in ministry, Prophetess considers supporting her family, her primary purpose and calling. As a wife and mother of three children, she strongly believes "church begins at home". Prophetess Wilma is a Pastor to many but a mother to most; she honors this responsibility by being a walking testament to the power of God.